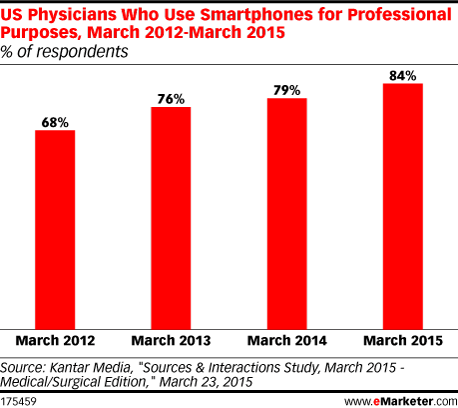 Data is from the March 2015 Kantar Media "Sources & Interactions Study, March 2015 - Medical/Surgical Edition." 1,655 US physicians were surveyed during September 2014 and 1,647 US physicians were surveyed during March 2015. Physicians were from 22 different specialties. The most recent six-month cycles of data were gathered via mail questionnaire during December 2014-February 2015 and via an online survey conducted in January 2015. A portion of the sample received an original mailing in December, while the other portion received an email invitation to the online survey in January or February.